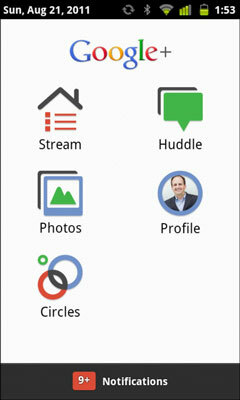 Google+ is currently available for two different mobile operating systems as well as the mobile web. On both Android and iOS phones and tablet devices there is an official app you can download to use Google+ on your device. Google has created apps for two basic mobile devices, referred to here as “experiences” — the Android experience and the iOS (iPhone, iPod Touch, and iPad) experience. Using the Google+ app on these devices is virtually identical. But due to limitations in the iOS operating system, the iOS experience is not nearly as deeply integrated into the operating system as the Android experience. The basic Google+ experience for mobile devices starts here. Automatic detection of your Google credentials: As with many apps on Android, Google+ uses Android’s built-in Intents API. This special feature of Android allows your device to automatically detect whether you’ve registered your Google account with your device. If so, you can just use your already stored Google Account to log on to Google+, which enables you to immediately start using Google+ and share with friends! Sharing from any app on your device: This feature is also part of the Intents API. Google+ enables any app on your device to add Google+ as one of the sharing options on your device. For example, if you take a picture on your device and the Google+ app is installed, you’ll see Google+ as one of the options to share photos (see the following figure). Just select the option to share a photo you took on your phone with Google+ and your photo, if you’ve registered your Google account with your device, immediately goes straight to Google+! This process works for any application that utilizes this feature. Sharing photos through the Share option on Android. Google+ widget: When you install Google+, you’ll see a new widget on your device (see the following figure). From your lists of widgets you can install the Google+ widget to your Android desktop and immediately start sharing to Google+ without needing to open the app. 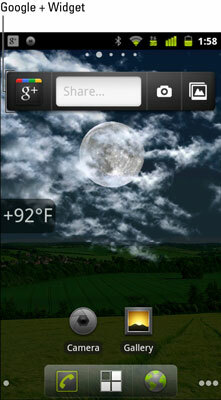 The Google+ widget on a Nexus 3 device (near top of screen). 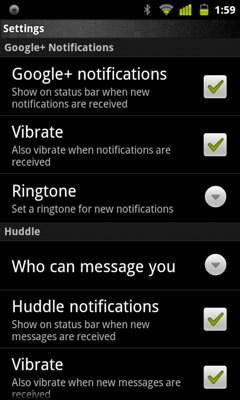 Integration with your device’s settings button: With Google+ open, you can tap your Android device’s settings button and settings for the Google+ app will appear (see the following figure). On this screen, you can send feedback to the Google+ team, set your notification preferences, and toggle your instant upload settings (see the next bullet). If you ever have an issue with the Google+ app on your phone, be sure to submit feedback to the Google+ team! This unique feature allows Google to improve the experience and identify flaws in the app. Google actually wants you to tell them what they can do better! Your Google+ settings on Android. 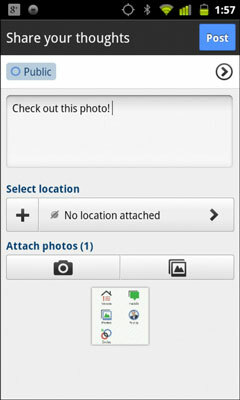 Instant upload of photos and videos: One convenient feature of the Android Google+ app is the ability to instantly upload photos and videos to a private web album. You’ll be prompted to turn this on the first time you open the Google+ app on Android, or you can go into your settings and turn it on there by just checking the box next to Instant Upload (see the following figure). These photos and videos will remain archived and private until you decide whom to share them with on Google+. Instant Upload can be a great way to keep backups of every picture or video you take on your phone. It also means you don’t have to spend time uploading them later! Turning on Instant Upload in your Google+ settings on Android.